My friend Trev got this tattoo several years ago and he claims it means "survive". A Japanese woman in a sandwich shop gave us some reason to doubt this when she claimed it does not translate to that but she declined to translate it for us, She did say it was "nothing bad" though. As you can imagine I'm looking forward to mocking him if it is wrong. Any idea what it says? 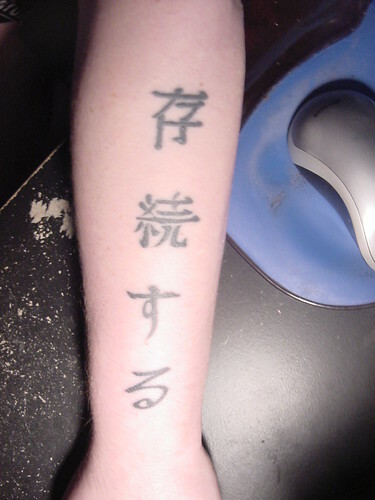 The tattoo reads 存続する [sonzoku suru] which means to "continue to exist." This is not the same as the ordinary meaning of to "survive" in English which should be translated 生き残る [ikinokoru], when referring to a person surviving some sort of disaster like a plane crash, or surviving to old age. The verb 存続する is not used to refer to people, but rather some sort of inanimate object or concept. Perhaps 存続 might be used in the legal concept of "survivorship" so that might be how the mistake occurred. I guess this is sort of "close but no cigar."